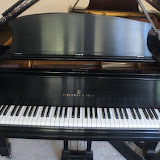 Steinway Model L "Tigerstripe" Mahogany, 5'10"
Steinway Model A Ebony, 6'1"
This Steinway "M" serial #250950 built in 1926, (the Classic Years) looks,Plays & Sounnds Great. It was refinished about 20 yrs ago, New Steinway Hammers with shanks/flanges, key bushings and key tops just installed in 2014. Soundboard & Bridges are in excellent condition and tunes very precisely. This 1904 Steinway "B" has a beautiful Tone and touch. It has been lovingly played and cared for by it's present owners since 1960. In 1995, a New Steinway action,Dampers,Strings and felts were installed to bring it back to like new condition. The Soundboard & Bridges are in excellent condition with no cracks or compression ridges. Since 1995, it has been tuned & Maintained by Chuck Terpo. Due to aging and Health Issues, we are reluctantly selling our Prized Instrument and hoping to find a New owner that will appreciate, love & care for it as we always have. Re-strung with new pin block; Re-guild and letter Harp; polish and seal soundboard; Install New Dampers; Replace Action, (using all new Steinway Hamburg Parts and Steinway N.Y. Hammers for tone and balance; Re-bush all keys; New Back rail cloth and Key punchings; New Regulating buttons and screws; Polish all key pins and capstans). The finish is Satin Ebony and has been professionally detailed and rubbed out. This is a very powerful "B" with an excellent Soundboard! No Cracks OR Compression Ridges! I have many references for my Steinway Restorations upon request. All parts and craftsmanship include a 5 yr. Warranty. Built in 1935. Restoration includes: re-strung with all new felts & new pinblock, dampers, new German Renner Action w/ NY hammers, beautiful ivories, re-bush keys, all new felts & punchings. Original soundboard & bridges in immaculate condition (no cracks or shims). Plate is re-guilted & lettered, polished brass pedals & hardware. 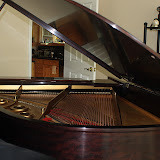 Hand-rubbed mahogany (Tiger Stripe) finish w/ 16 coats Steinway Lacquer. Not only stunning to look at, it plays & sounds incredible. Includes bench & cover. Built in 1886. Restoration includes: new soundboard/bridges, re-strung with all new felts & new pinblock, dampers, new Steinway action (hammers w/ shanks & flanges, reps, regulating screws & buttons), re-bush all keys, all new felts & punchings. Hand-rubbed Satin Ebony finish w/ 16 coats Steinway lacquer, plate re-guilted & lettered, pedals & all hardware are re-plated nickel. Includes bench & cover. Contact Chuck for more information.